I need no other tacos right now. None. These bang bang cauliflower tacos are all that exist. It’s no secret that I have a lot of favorites. But wait, tell me – who doesn’t have a lot of favorites right now? Is it possible to live in 2018 and NOT have a ton of favorites? I think not. This is seriously the best new favorite thing ever and that’s it. I told you that I’m in a cauliflower mood! Like, three years too late, right? Yesterday in an interview someone asked me what I thought the next big food trend would be and I didn’t even know what to say because I’m always so behind the trends. Ever since making that sweet and spicy roasted cauliflower, I’ve been craving another version. We’ve always loved bang bang shrimp and I shared this lightened up version from Gina’s book years ago. And I’ve wanted to do it with cauliflower for soooo long. I never thought the bang bang sauce would be something that I love, but it’s incredible. And it’s embarrassingly easy. Only three ingredients! Mayo (don’t hate! it’s oil! and egg yolks! ), sweet chili sauce and a spicier chili sauce. It creates this amazing flavor profile and you’ll want to put it on everything you eat for the next week. And I doubled the recipe here because you definitely want a little extra sauce on hand. But make sure not to over-coat the cauliflower. You don’t want it to be a soggy taco mess. I mean. That certainly doesn’t sound delicious. Now here’s the thing – these are a leeeeettle bit high maintenance. Just a touch. The best version of them? You want to make a (very light) bubbly batter and pan-fry (not deep fry!) them until they get an airy tempura-like coating. Because that makes for the best cauliflower to be tossed in the sauce. It’s worth it. I swear. However! If you’re in a pinch? I hear you. Of course, you can roast the cauliflower and cover it in the sauce. You don’t have to lightly fry it at all, but that wonderful crisp batter makes it so super crunchy and delicious. Like texture heaven. Is there really a question of what kind of taco to eat this week?! In a bowl, toss together both kinds of cabbage and the cilantro. Toss with the lime juice. Set aside. Heat a large skillet or pot over medium-high heat. Line a baking sheet with paper towels. Chop the cauliflower into florets - you don't want the florets to have long stems or else they won't cook evenly! In a small bowl, whisk together the flour, club soda, salt and pepper to create a batter. Add the canola oil to the hot skillet. Dip each floret into the batter, coating it completely. Place it in the oil and cook evenly on all sides - until you have a light golden batter. You can do a few pieces at once, but don't overcrowd the pan! Once each piece is crispy, place it on the paper towel lined baking sheet and repeat with remaining cauliflower. Once all the cauliflower is crispy, make the sauce. In a bowl, whisk together the mayo, sweet chili sauce and chili garlic sauce. This makes about double the sauce that you need, but it's SO good to have extra so you can drizzle it on the tacos! Take half of the sauce out of the bowl and set it aside. Add the cauliflower to the remaining sauce and toss it well (but gently!) until the pieces are coated. Top with the fresh chives. To assemble the tacos, place a scoop of the cabbage slaw in the center of the tortilla. Top with a spoonful of the cauliflower. Drizzle on extra sauce and serve with a spritz of lime! Seriously the best thing to come out of my kitchen in weeks! Totally worth being high maintenance – cauliflower forever. cauli is my favvvvvv vegetable and seeing this used in tacos is making me so so happy! OH. MY. GOSH. These look incredible! Amazing! Going to bypass the cauliflower prep and attempt this with Trader’s Joe’s tempura cauliflower and see how it turns out! love that idea! let me know how it works! I tried it with the TJ’s tempura cauliflower tonight and dinner was tasty and quick! Thank you for the delicious recipe, Jessica, and thanks to Chrysta for the easy version! A win with my daughter too! What kind of chili garlic sauce do you use? I can never find it at the grocery store when you list it in a recipe. i can usually find it in the asian section of grocery stores! I’ve recently discovered my love for anything cauliflower (can you imagine that I did not like this particular kind of vegetables a few months ago??) and can’t wait to try this. I love tortillas/tacos and I guess topped with cauliflower they must be utterly tasty! checking … 1/2 tablespoon mayo ? I just have to tell my girls it’s white Broccoli, then they will eat it…… go figure? Me and my husband, we’re the easy ones. I’ve done buffalo cauliflower tacos before and baked the batter dipped pieces on a metal rack on a cookie sheet so the batter can drop down and the florets get crunchy. Not the same as frying but it takes less time and mostly crispy. Will try with this recipe! This is my favorite dish. 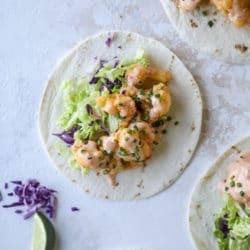 Amazing Tacos and their recipe. Thanks for sharing your idea. I appreciate your work. I love cauliflower and have never thought of using it in tacos this way. I’ve already added the ingredients to my shopping list and look forward to making this recipe. Taco Thursday’s meets cauliflower. oh my. making these this week! I added these to my weekly menu a while back. The night we were supposed to make them, I had to work late so my other half did the honors of cooking dinner for us. What a mistake it was to put these on our menu. Because now we CANNOT STOP making them! I would be happy with just a pile of the bang bang caulifower and the sauce. But put them in a taco and Im going to need 1000 of them. If you need me, Ill be cooking bang bang cauliflower tacos for the rest of time. I don’t like the taste of cauliflower as much as I don’t like the taste of seafood but there was a time that i did have bang bang shrimp and didn’t die. I am wondering right now how would this be with potatoes? Thoughts?